Astronomers made the discovery after measuring the size and mass of the baking-hot planet, named Kepler-138 b, which orbits a red dwarf star called Kepler-138. Mars is only 53 percent the size of the Earth (or just about half the size), so Kepler-138 b is smaller than the Earth. By studying data from the Kepler probe, scientists have found a planet about the size of Mars, about 200 light-years away from Earth. See facts about the smaller-than-Earth planet Kepler-138 b in our full infographic. The least massive known alien world may be the exoplanet PSR B1257+12 b, which has an estimated mass only about one-fiftieth, or 2 percent, that of Earth. However, that world does not orbit a normal star, but instead circles a pulsar — a dense, rapidly spinning remnant of a supernova explosion. 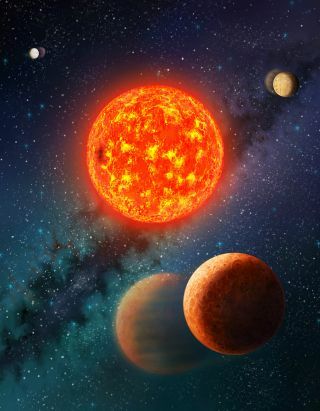 Although Kepler-138 b may be similar in mass and width to Mars, it is so much closer to its star, and thus hotter, meaning it is likely very different from Mars, Jontof-Hutter said. "In fact, all three planets orbiting Kepler-138 are likely too hot to retain liquid water," Jontof-Hutter said. On the outermost planet, surface temperatures are about 250 degrees Fahrenheit (120 degrees Celsius), while those on the innermost planet are about 610 degrees F (320 degrees C).